Chess is now helping to improve social cohesion and inclusion, explained Kouatly in his remarkable presentation: “We are a tool in the public policy in France.” The prime example is an agreement with the Ministry of Justice´s Department for Youth Protection. Adolescents at the brink of prison can now learn and play chess. The Ministry is paying the chess teachers and club membership fees. When Kouatly was elected as Federation President two years ago, Jean-Michel Blanquer was one of his election team. Blanquer has since become Minister of Education and is opening doors for chess in France. The Federation has signed agreements with the national associations of sport in primary schools (USEP), sport in secondary schools (UNSS) and with French schools outside of France (AEFE). An important meeting with the latter prevented Johanna Basti from coming to the London Conference. 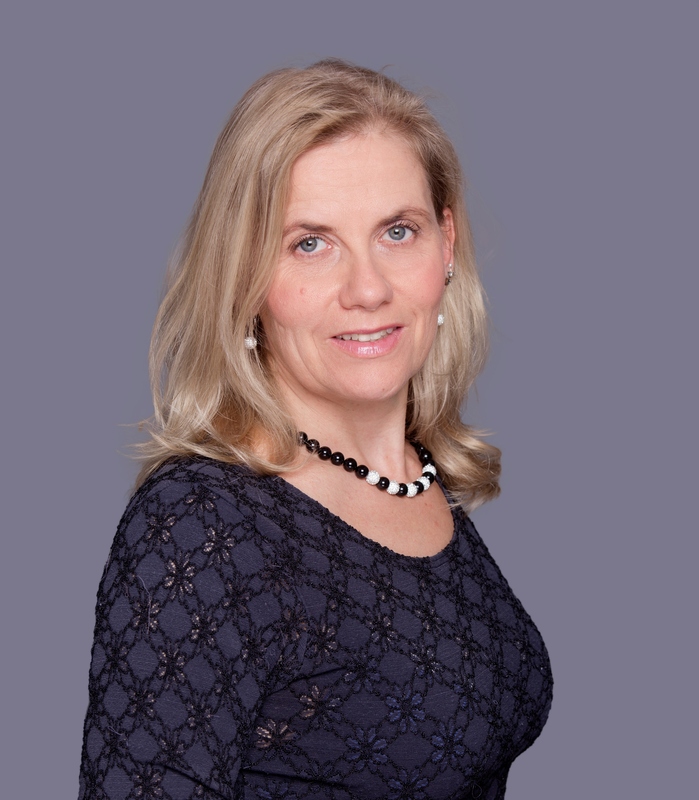 She negotiated the contracts with the national institutions on behalf of the Federation and is a member of the new Education Commission of the European Chess Union. Blanquer and Basti believe in the social potential of chess but are not rooted in competitive chess. In the past, the French Federation had been run by school teachers who, perhaps paradoxically, were oriented to competition rather than education. Their commitment to the conventional implementation of chess left no room to develop chess more widely within society. During the parallel sessions of the conference you will have a choice where to go to. Here are brief summaries of the workshops in chronological order. Workshops form a large part of the London Chess Conference programme. They provide ample opportunity to present projects and findings, exchange best practices and to discuss challenges and new ideas. Many ongoing conversations and cooperations have started at our workshops. The range of workshop topics reflects the diversity of our attendees. Chess in Communitities (Saturday 15-16) and Early Years Chess (Sunday 13.45-15.15) gather best practice examples in the respective fields. Chess in Prisons (Saturday 15-16) has the specific goal to start an informal network of chess-in-prison projects and also link them with a researcher interested in studying the effect of chess on inmates. Making School Chess Research More Relevant (Sunday 13.45-15.15) brings together scientists and school chess leaders to discuss methodological challenges and ideas for future research. Increasingly we hear that chess not only helps with numeracy and literacy. Therefore we introduce a workshop on Promoting Social Skills through Chess (Sunday 13.45-15.15). Maybe surprisingly, we never had a workshop before on Large Scale School Chess Events (Sunday 9.30-11) even though the UK Chess Challenge, Schack4an, K12 Nationals, Linkes Alsterufer gegen Rechtes Alsterufer and Belaya Ladya are legendary events whose strategic value for public affairs and marketing cannot be overestimated. Speaking of Strategy, another ground-breaking topic is School Chess Strategy with so many speakers and organisations lined up that this workshop will come in two parts (Saturday 15-16 and 16.30-18). Following up on this is a workshop on Business Development for School Chess (Sunday 9.30-11) which promises to be highly relevant for aspiring project leaders and professional chess teachers. Neil Dietsch is leading this. Also on Sunday morning we will feature two pioneers: Kevin Cripe, a Californian school teacher who has started a chess project for impoverished children in Panama, will discuss didactic innovations as described in his new book The Learning Spiral (Sunday 10-11). Boris Raguet, a French teacher and teacher trainer, will show how to apply chess to teach coding and other computer skills (Sunday 10-11). Make your pick! 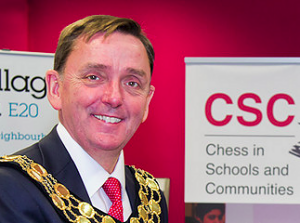 Sir Robin Wales is the Mayor of Newham and a supporter of chess in schools and communities. The London Borough of Newham has taken the lead in providing services for its citizens through a partnership with Chess in Schools and Communities (CSC). Newham is one of the poorest districts in not only London but England and has one of the highest ethnic minority populations. The London Olympic Park and Stadium were located at Newham as part of a regeneration plan. Chess is known to be relatively most effective in improving the educational attainment of children from deprived families and those whose parents were born abroad. Newham wants to ensure that its children and the wider community are able to access supervised chess sessions. This could only happen as a result of political support. In the last Council the Newham Labour party election manifesto included the promise that “Every Newham child a chess player”. The Council has contracted CSC to provide chess services. Through the partnership between Newham Council and CSC, over 1100 children in 21 Newham schools receive a weekly timetabled one-hour chess lesson. In addition there are another 150 children playing chess in either breakfast, lunchtime or after school chess clubs. This contract is a model that could be adopted by other local authorities. As part of the contract, CSC also runs community chess clubs in five Libraries. These are popular with over a hundred adults and children playing regularly. Two more Libraries wil join the project in 2016. To continue the community ethos, CSC runs a Newham team in the London Chess League which gives an opportunity for adults to play at a higher level. Children are also encouraged to be involved in competitive chess. CSC supports the Newham primary school team in the EPSCA (English Primary Schools Chess Association) tournament at the under 9, under 11 level. Newham is to host the 2016 under 9 East of England zone. This academic year CSC started a five tournament junior grand prix series in Newham, running from September 2015 to February 2016. This gives the juniors of Newham a chance to play tournament chess within three miles of home. The Newham/CSC project has produced some very strong juniors who regularly compete in and win age group tournaments in Essex and Kent. Towards the end of the academic year, CSC hosts a Newham primary school team championship, which this year attracted over 200 children. In summer 2016 CSC is looking to hold an adult chess congress in the Borough. Richard Harding, the CSC project co-ordinator said “The partnership between Newham Council and CSC gives opportunities not just to its young people,but the whole Newham community to learn the fantastic game of chess”. Newham Councillor Ken Clark will be the opening speaker at the conference. In the photograph at the top, Newham children are playing an online match against a team from Sunrise, Florida. The match was organised with the support of the both Mayors. Sean Marsh runs chess projects in Teesside in the north east of England bringing many children into chess. 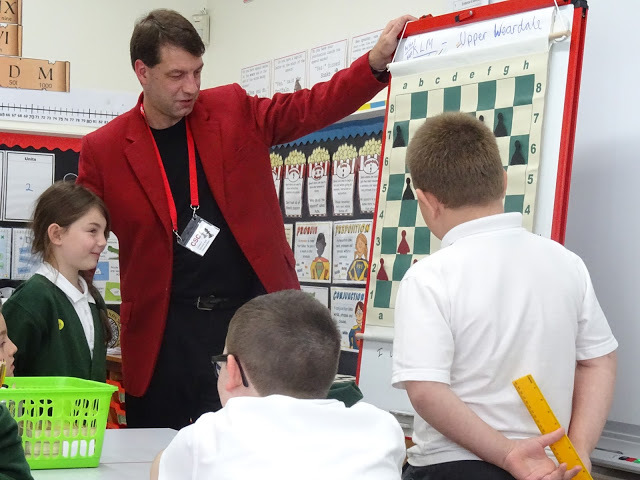 He reflects on the factors which inspire teachers to offer chess. 1) Concentration. To play chess well – or to solve chess problems – children must learn how to improve their concentration and to remain focused and ‘‘on task’’ throughout a full game. It is very noticeable how games between the children start to last longer as they progress through their weekly lessons. Generally speaking, children have a strong desire to win when they play games and they quickly understand how paying attention during the lesson input leads to improved results over-the-board. 2) Discipline. It is not always easy to maintain discipline during a game of chess, in which mistakes – large and small – will occur on a regular basis. Yet self-discipline is an important characteristic if one seeks success. Through chess, children learn to live with the responsibilities of their actions. One bad move can undo a lot of hard work, but children learn how to deal with disappointments and – even more importantly – how to recover and come back stronger next time. 3) Good sportsmanship. Fortunately, chess retains a certain degree of etiquette missing from various sports and games with a higher profile. Children are encouraged to shake hands before and after each game, regardless of result. Bad sportsmanship can lead to reduced opportunities (losing a place on the school team, for example) as children must, at all times, remain perfect ambassadors for their school. 4) Impact on Literacy and Numeracy. Chess in Schools and Communities recently collaborated with the Education Endowment Foundation (‘EEF’) to assess the impact of regular chess. The fact that the EEF should feel inclined to conduct a serious study on the impact of chess lessons should provide ample indication of the growing status our of our curriculum. Chess is traditionally linked with mathematics but I strongly feel the impact on other academic areas is consistently underrated. An easy example would be to highlight the creative and imaginative skill required to visualise a desired position a few moves down the line; such skills are transferable to other academic pursuits, such as writing stories, for instance. 5) General Learning Skills. Chess lessons offer a perfect combination of the three key types of learning: auditory (listening to the tutor), visual (watching the action on the tutor’s demonstration board), and kinesthetic (working in the pupil workbooks and playing games). 6) Opportunities. Chess is an absolutely ideal game for breaking down boundaries. Time and again it comes as a great surprise to teachers when they find particular pupils excelling in our lessons and tournaments. With everyone starting from the very beginning, previous classroom ‘‘pecking orders’’ and the like are rendered superfluous. Additionally, children who do not excel at sports have the opportunity to represent their school for the first time, thus boosting their confidence and pride. Sean, author of a recent Batsford book From Beginner to Winner will be speaking about chess in the Teeside community at the conference. In the Roma culture children are usually removed from school at an early age before they reach secondary school. They may have a basic grasp of numeracy and literacy but they do not benefit from the wider educational opportunities. The children who stay at home with unemployed parents in impoverished conditions have limited chances in life. This is a particularly serious issue in Eastern Europe where there is a significant proportion of the populartion who are Roma. A project in Hungary is trying to address this problem. The Ministry of Education has selected the Chess and Logic programme developed by Erzsabet Sarlos and her team to make school lessons more interesting. They have found that when children play chess at school, their motivation to remain at school increases. The effect is greatest when children are introduced to games-based learning from the age of 6 or 7. The mayor of a Roma town is leading the introduction of the programme in the local school. Teachers do not need to be a chess player or a logician. The teachers undergo a well-designed 60-hour training course and are provided with the classroom materials. The programme is in its early stage but they have noticed improvement in the behaviour of the children. There is a high incidence of fighting among the community as a way to resolve differences. Chess teachers emphasise the need to respect one’s opponent and to accept defeat in good spirit. The morality of chess may be more important than the logic. The most common place to play chess in England is in a pub. This is not because pub regulars decide to take up the noble game. It is because most clubs hold their league matches in a pub. Typically they will occupy a dingy room upstairs, the landlord glad of a little extra custom. The clubs usually have little choice as to where to play. We should of course welcome chess in pubs. The informality of the surroundings promotes social interaction. Other members of the public can observe chess being played expertly with clocks. Many people approach the boards to watch and often enquire about getting involved. 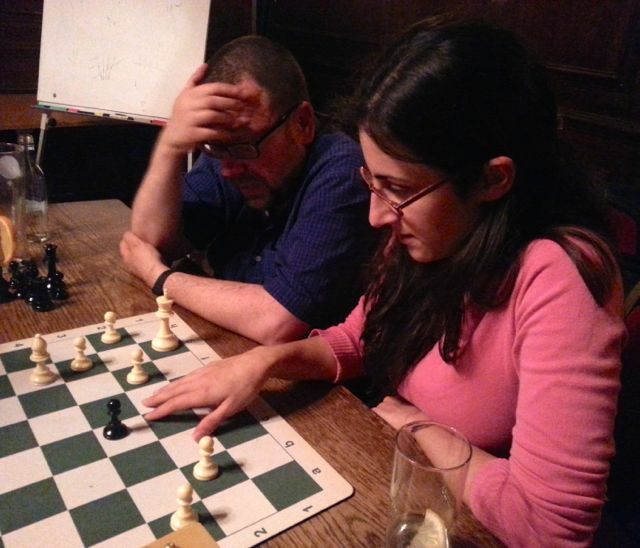 Pubs bring chess out into the wider community. The Kings Head pub in Bayswater, west London lent its name to a famous chess club. The aptly titled Drunken Knights club plays in the Plough near the British Museum. My local club in Kingston-upon-Thames plays at the Druids Head pub in the historic market square. We are not alone in our quest. A board games club meets there as does the local Philosophy discussion society. Pubs are the new community centres. They need us because they are losing custom to drink-at-home, pay-TV lifestyles. Clubs are moving to pubs not just from choice but because there has been a shift in community infrastructure. The places where clubs once met are rapidly disappearing or have become unaffordable. The other traditional places where clubs met were in church halls, community centres and in workers or veterans clubs. All of these are under threat of closing. The unstoppable economic force is the increasing rent. The population density in London must be amongst the highest in the world and this is driving up the price of space. There was a time when there were places where members of the public could congregate for convenience or social reasons – promenades, bandstands, station concourses etc. These have virtually all been privatised. Public space owners and councils have leased the space to commercial enterprises. If you sit down anywhere you are expected to buy at least a drink. Church halls are disappearing along with the churches as the nation becomes more secular and mall shopping has replaced Sunday worship. Working Mens clubs are disappearing as industrial activity dwindles in the 24/7 service economy. Veterans clubs disappear as the memories of war fade. We are instead seeing a boom in new building developments – luxury apartments being the investors’ favourite. Society is always changing and chess must adapt. Gone are the days when a typical chess club might have a hundred members meeting several times a week in a well-furnished community club. Membership of clubs has reduced to a quarter of the level 25 years ago. The lower level of membership cannot sustain rental payments any longer. Clubs are moving to pubs because the publican is hoping that the players will buy some beer. Julian Way and Olga playing as a pair. This exposes the risk of pub chess: the publican may eventually find that chess players are so engrossed in their chess that they do not buy as many pints as a regular customer. Also some players may feel that alcohol may impair their cognitive processes. The net result is that the economic justification for accepting the chess club is disproved with unfortunate consequences. There is a depressingly familiar pattern: another event provides more profit for the pub especially around Christmas and New Year. A wedding or birthday event could take priority at any point during the year. Or the landlord comes along and announces an increase of the rent at short notice. Hence there is a phenomenon of pub-hopping as clubs move from one disaffected publican to a fresh one and the process goes through a repeat cycle. But let’s not dwell on the possible downsides. Traditionally pubs are places to relax and spend leisure time of which playing games was a regular element. The factor which makes chess expensive is that chess players like silence. It is the demand for a private room without noise which creates our problems. Hence the answer to our problem is that we need to revert to the social approach to games playing. There must be more tolerance of noise. Players play for fun rather than for glory. Casual games are proving very popular. At Kingston we alternate serious chess nights with casual chess nights. The Casual Chess club meets every day in the British Film Institute café just off Tottenham Court Road and people of all levels turn up to play. The first law in England which mentioned pubs was in 1495. Its purposes was to restrict the popular games which were distracting men from their duty of practising archery. In England, people have always enjoyed beer and games in the pub and this tradition is going to make a comeback. By the end of the year, more than a million refugees who are seeking asylum will have been registered in EU countries. Projects in Germany, Sweden and the Netherlands have deployed chess as one of the elements assisting the rehabilitation and integration of refugees. One of the features of chess is that it is an international language in itself. People from different coutries can begin to communicate across the board. One of Germany´s biggest refugee reception centres is located in Munich in the Bayernkaserne. The Münchener Schachstiftung (Munich Chess Foundation) started the initiative in 2011 and then raised support from other foundations. Chess tutors are employed to supervise chess events each Friday where instruction is given to beginners and intermediate players. In another project, a special school for unaccompanied young refugees, Schlau-Schule, ran four classes were run during the last school year. Several of the students had learned the game at the chess meetings in the Bayernkaserne Project supervisor Dijana Dengler of the Münchner Schachstiftung is moved by the memory of how Afghan youngsters started to invite everyone interested to late night chess sessions. 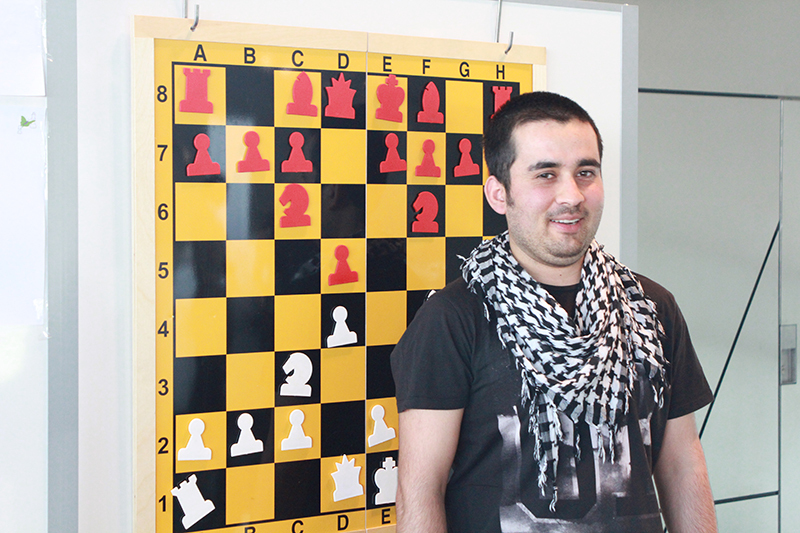 Mustafa is one of the students of the Schlau-Schule for refugees in Munich – and he loves chess a lot. Those who show an interest are also invited to the chess club. Offering tournaments makes little sense, as the refugees are usually just staying for a few weeks. Van der Mark encourages them to join one of the free chess sites on the internet in order to stay in contact with others who keep playing. He has also make some connections with chess clubs in the refugee’s new place so that they receive a welcome. Chess can provides a ready-made social network. Van der Mark is unaware of other Dutch chess clubs that have followed the example of Doetinchem, “because we didn´t make a noise about this”, but the local media found out about the project and loved it. Here you can see a TV report (in Dutch)..
Only men and boys joined the chess sessions. 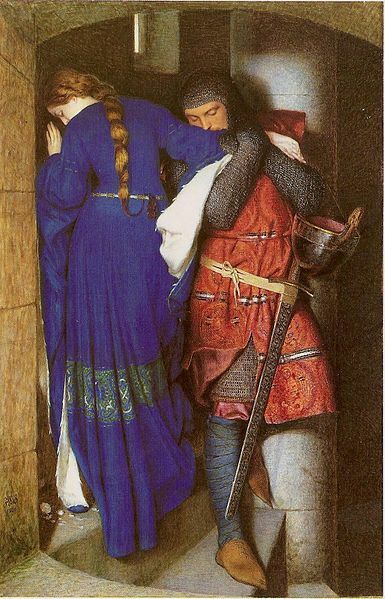 As Van der Mark noted “They kept saying that women don´t have a place in war, and they pointed out that what we call queen is in Arabic a vezir – a minister”. Some of the Syrian children would move the pieces in a different way. They play a variant called “damen” (a word which means “draughts” in several European languages). In Sweden, instilling an interest in chess fever has been found to improve the mood of formerly depressed and isolated youth. Ake Drott, a therapist and social worker specialises in unaccompanied young refugees at Steget Verdare (One Step Further), a non-for-profit organisation in Mölndal near Gothenburg. Two years ago he started using chess and has been passing on his lifelong enthusiasm for the game to the young people he is assisting. “Chess works tremendously well: they feel better, they get better at school, they get along better with others. Everything!” says Drott. Last year Ake and his team leader, Pontus Teiler, participated in a graduate seminar on chess teaching at the University of Malmö. They documented and analyzed their experience which now comes as a basis for a presentation at our conference. Drott, Dengler and Van der Mark will all share their experience in our workshop Chess for Refugees and encourage others to establish projects elsewhere.